Provision TheaterCompany‘s world premier production of Wonders Never Cease has all the trappings of a wacky children’s comedy. Think “Miracle on 34th Street” meets “3 Ninjas”. Its overly simplistic portrayal of religion, faith, people, relationships, right and wrong makes it easy to follow but hard to stomach. Jokes arise out of tired premises, while characters are pulled from the archetype bargain bin. And the ending is so saccharine sweet, it will make your stomach turn. Provision is known for its religious-themed plays. Its mission is to produce works of "hope, reconciliation and redemption." Wonders Never Cease is no exception. It attempts to dramatically answer the question, "Do angels really exist?" Unfortunately, the sophomoric manner in which it illustrates this theme is so simplistic it’s insulting. It doesn’t matter if you’re a believer or not. The surface-level treatment this weighty topic is given is sadly laughable. By painting with such broad brush strokes, playwright Tim Gregory (who adapted and directed the play and serves as the company’s artistic director) inadvertently creates a number of paradoxes that muddle the meaning and erode the play’s potential. Wonders Never Cease centers on Leah (the very talented and young Caroline Heffernan), a little girl who claims to have seen an angel on the side of the road. Those close to her are skeptical of her visions, including her mother (Katherine Banks), her mother’s boyfriend (Ryan Kitley) and her teacher (Matt Klingler). Leah’s bizarre visions raise eyebrows, and soon the school is recommending a complete evaluation. Meanwhile, the boyfriend, Kemp, works as a nurse who isn’t afraid to overstep his authority. When he is assigned to care for a comatose female celebrity (Holly Bittinger), he devises a moneymaking opportunity. This is good news for him, considering he owes big bucks to an East Coast loan shark (Sean Bolger). Kemp, the loan shark, the celebrity’s agent (JoBe Cerny) and a book publisher (Michael Wollner) conspire to fool the celebrity by implanting her with a false religious vision. The plan is that when she eventually comes to, she’ll confuse the ruse for reality and write a best-selling novel. I don’t want to spoil it, but, suffice to say, things go awry. Despite its weaknesses, the play has several strong points. First, the acting is top tier. Little Heffernan is a darling young actress. It’s hard to keep your eyes off of her. The performers are eloquent and dynamic. Unfortunately the characters they’ve been assigned to are paper-thin. In fact, half are offensive cultural stereotypes. You have an overweight mammy, a wise old black man, an Italian mobster and a Jewish talent agent who occasionally drops some Yiddish and, at one point, refers to himself as a parasite. The play delivers one comedic triumph—the spot on Oprah impression. The opening parody commercial is a funny bit, too. It’s for a book titled Lattes with God and seeks to lampoon all those feel-good, spirituality books on the market. But unfortunately, the play lacks the awareness to understand the slippery slope it establishes. If Lattes with God is absurd, what about the premise of this play? For that matter, what about the books of the Bible, which were notated by men who were also hearing the word of God? Does the presence of a latte make all the difference? In addition, the play has a very myopic view of spirituality. The cartoonishly villainous bad guys try to create a false dogma, one that centers on the self. Their catchphrase is, "It’s all about you." I get it. This is the "me" generation, and blatant selfishness is wrong. But they confuse the notions of self-love and self-compassion with pride and greed. In the words of Ru Paul, "If you can’t love yourself, how in the hell are you going to love somebody else?" On a technical level, Wonders Never Cease is a good play. The production level is high, and the acting is strong. But underneath the high-gloss finish is little more than marshmallow fluff. This is junk food for the brain. It’s accessible and immediately gratifying. But you’ll be hungry for some substance soon after. 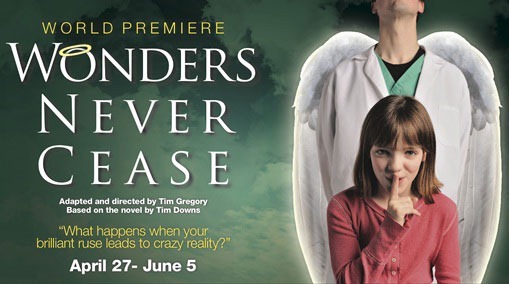 Wonders Never Cease runs runs Saturday, April 30 through Sunday, June 5 at Provision Theater located at 1001 W. Roosevelt Rd. 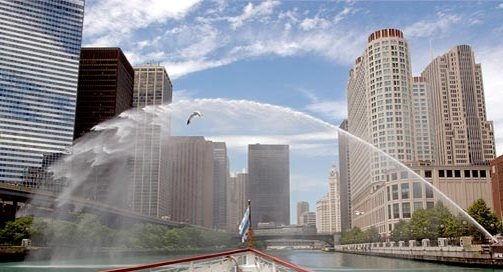 The performance schedule is Fridays and Saturdays at 8 p.m. ($28) and Sundays at 3 p.m. ($25). Student and group discounts are available. For tickets call 866.811.4111 or visit www.provisiontheater.org. C.S Lewis had a flair for turning complex theological and philosophical ideas into digestible, entertaining narratives. He was a profoundly influential man with a distinct voice and a fascinating life. 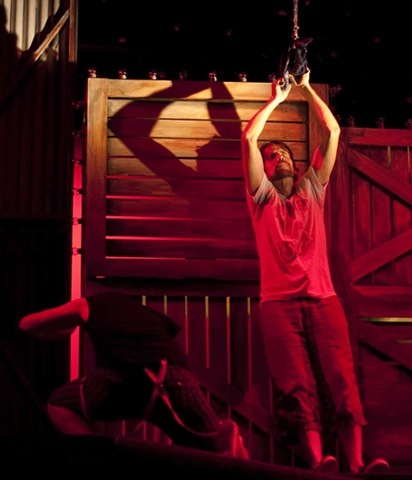 In Shadowlands, Provision Theater works with a rich subject with a compelling story. The creative team behind this bio-drama obviously has a fondness for the British author. What they could really use are some of his writing tricks. William Nicholson’s script desperately needs editing. Heavy-handed, clunky, and overlong at two and a half hours, the text undercuts its own story with linear, tedious construction, and scattershot attention to dramatic build. Exposition is not the same as action, and Shadowlands relies mostly on characters standing around telling each other what’s happening to relate the plot. Moments that play out theatrically are rare, but enlightening. On their tropical honeymoon, Joy teaches her husband to sit and bask in the sunlight. So far, we’d only seen the academic Lewis in authoritative formal wear in stuffy, drab English surroundings. Sprawled comfortably on a bench, Joy teaches him patiently, informing him that presence is a virtue without speaking a direct word about it. When he gets it, we see the tension release from his shoulders and the appreciative grin of realization. His wife is good to him, and without her, even a renowned intellectual like him would never have enjoyed this beautiful, divinely simple pleasure. In that scene, Nicholson creates a thin-sliced moment of life–we understand why Lewis fell in love with Joy Gresham and what he’ll miss when she passes, all from a few sentences about the sun. Good theatrical scene work works as metaphor. The rest, however, is so literal. Every key point of Lewis and Gresham’s relationship–letters, first meeting, introduction to friends, divorce, secret wedding, first bout with illness, public wedding, honeymoon, second bout with illness, death, grief–is played out or discussed at length. It’s one thing to be respectful with a narrative, but it’s another to champion reality over storytelling. Creative license is not a tool for the selfish, but the thoughtful. Refining a real-life story into fiction brings out a chosen element of its truth. Instead of highlighting or heightening aspects of the protagonists’ relationship, Nicholson and Director Tim Gregory jam in as much as they can, progressively devaluing the scenes as they pile more and more on the stage. Substance needs style in order to move audiences. In Act I, while visiting Lewis abroad, after learning of her first husband’s affair, Gresham informs Lewis she is leaving back for America. He’s hurt. The curtain closes. A few moments later, it opens. She’s back and Lewis is surprised. How are we supposed to care about her return if we never had time to miss her to begin with? Working with limited dramatic resources, the actors give remarkable performances. Brad Armacost reprises his role of the title character from Provision’s earlier C. S. Lewis Onstage. He’s lovable, thought-provoking, and a master of his language. He’s easily believable as the distinguished theologian. 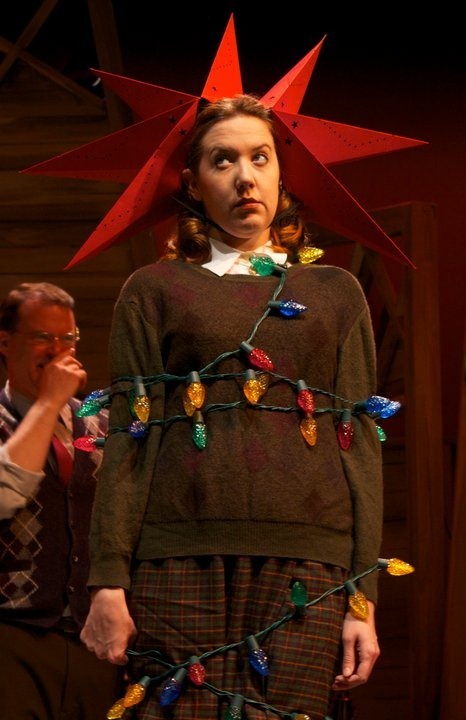 Susan Moniz (Gresham) is assertive, joyful, funny and extraverted. 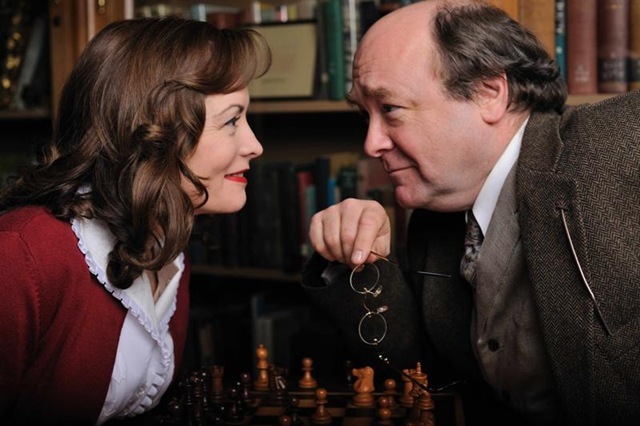 Shadowlands’ respect for its material is admirable, but as C. S. Lewis taught us, so is imagination. Without it, no dedication to truth will ring as poignant. Mrs. Bradley (Cheryl Golemo) has bitten off more than she can chew. Mrs. Armstrong (Barbara Figgins), who usually directs the church’s yearly Christmas pageant, cannot move from her hospital bed, her leg awkwardly suspended in traction. So, Mrs. Bradley has agreed to take over her directorial duties. So far, in Provision Theater’s The Best Christmas Pageant Ever, everything seems quite doable until Mrs. Bradley’s son, Charlie (Ryan Cowhey), lets it slip to one of the Herdman children, bullies and roughnecks all, that rehearsals for the pageant are followed by cookies, donuts and other refreshments. That brings the herd of Herdmans to rehearsals at the church and they proceed to hijack the production by taking over its leading roles. 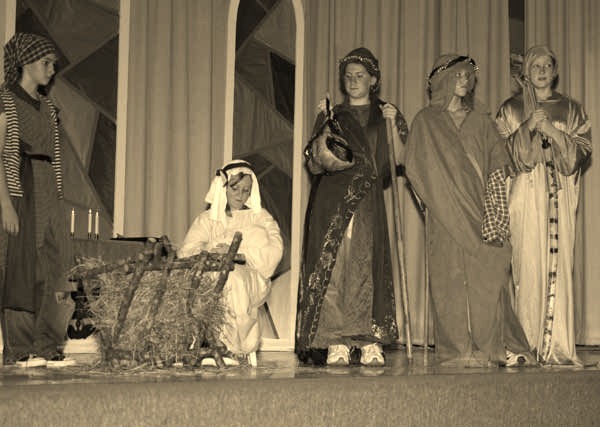 Local, homespun Christmas pageants are familiar rituals that bring communities together to view comforting tableaus of the Christian narrative of the birth of Jesus. 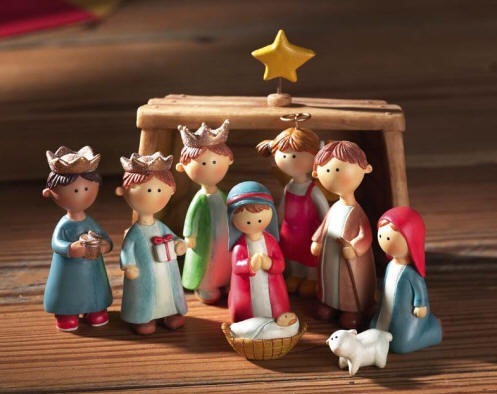 Attend and you are sure to hear the same passages of familiar Scripture, see a familiar nativity scene, and go through the familiar arrivals of the shepherds and the Three Wise Men. Generally, it’s an evening without surprises but with kids there are no guarantees. Provision’s pageant drama is different from the usual, in that it relies on the unpredictable nature of kids for its humor and suspense. Directed by Tim Gregory, The Best Christmas Pageant Ever also takes some healthy swipes at pettiness in churchgoing culture: the Herdman’s being the poorest family in the community and their children knowing little to nothing about Jesus’ birth, while the community’s church ladies are in a snit to they discover that they have taken the leading roles in the pageant instead of their own children. Mrs. Bradley can feel community support slipping away from her production, as well as her control of her young actors slipping away during the rehearsal process. Much about Provision’s production still has rough edges. Since most of the roles are filled with untrained child actors, the production definitely has ‘community theater’ written all over it. But it’s surprising how much Gregory can evoke small miracles with his young and inexperienced cast. Imogene Herdman (Page Weaver) ultimately does make a sympathetic and convincingly loving Mary. The sacrifice that the Herdman children make to welcome the baby Jesus is honestly touching. Along the way, little touches that evoke the individual personality traits of the cast make each child special to the audience. In fact, its the small touches that entertain more than the manic comedy scenes. Mr. Bradley (Andy Luther) brings a solid strain of authenticity when centering Mrs. Bradley’s creative efforts on the real meaning of Christmas. While not a totally professional effort, families will no doubt enjoy The Best Christmas Pageant Ever. A bluegrass musical set in a Baptist church at the start of World War II? Let’s just say that I went into Sanders Family Christmas with low hopes. From the corny promotional images, I got the impression that Disney’s Country Bears are probably a more nuanced group of characters, and I feared the inevitably high cheese factor that comes with a traveling Christian family band. To my surprise and delight, Connie Ray and Alan Bailey’s musical defies all expectations, crafting one of the best Christmas shows that I have ever seen. Director Tim Gregory and his outstanding ensemble of actors do an exceptional job making the dire circumstances of wartime America feel real. Despite being the direct sequel to Smoke on the Mountain, no previous knowledge of the Sanders family is required to enjoy this Christmas celebration. With the audience serving as the Mt. Pleasant Baptist Church congregation, the group performs a mix of popular Christmas hymns and bluegrass inspired holiday songs. Between musical numbers, each family member is given an opportunity to witness for the congregation, and these moments are the dramatic high points of the production. As middle class Americans work extra long hours in factories and ration meals to support their troops, the Sanders family provides a source of hope and strength, and Provision Theater’s production is similarly inspiring. With their only son Dennis (Brian Bohr) preparing to ship off to Marine basic training and twin sister Denise (Christine Barnes) joining the USO, the Sanders family is undergoing its own personal crisis. Despite their fears, they put their trust in God in hopes that he will ultimately guide them in the direction of the greater good. The characters’ sincerity in their faith prevents them from being preachy or heavy handed, and their chemistry as a family brings a true sense of togetherness to the proceedings. The Sanders understands that they’re putting on a show, and their ever present witty banter keeps the tone light, even as the script delves into bleak areas. Sanders patriarch Burle (Richard Martlatt) and his brother Stanley (Ron Turner) have two of the strongest moments in the show when they witness. Martlatt showcases his outstanding technique during a fast-paced, ten-minute monologue where he recalls his days as a trench soldier in World War I. Despite the heavy material, Martlatt’s breezy delivery maintains a level of humor that work in beautiful contrast with the weight of the words. An ex-convict turned gospel recording sensation, Stanley laments his criminal background while praising the Sanders for graciously accepting him into their family. Turner takes his time with his words, deliberating over the perfect way to describe the kindness that his family has shown him. The joy on Turner’s face as he recalls the upswing his life took after he found God warms the heart, and his ultimate conclusion that “God don’t give two cents about talent, he cares about character,” is a wonderful moment of catharsis for the weathered Sanders uncle. 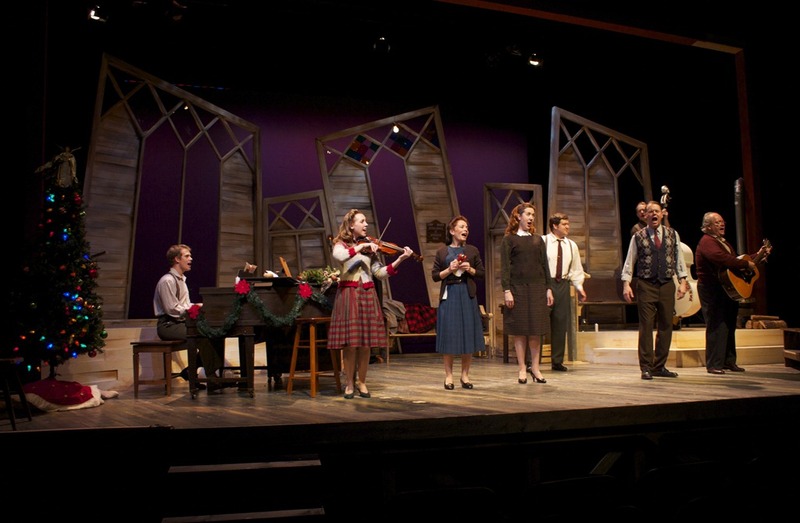 Playing their own instruments and singing without any amplification, the cast is exceptionally talented. Whether they’re wrapping older sister June (Amber Burgess) in Christmas lights, delivering a youth sermon to the children of the church, or singing “Joy To The World” with the audience, they manage to engage on a deeply personal level. 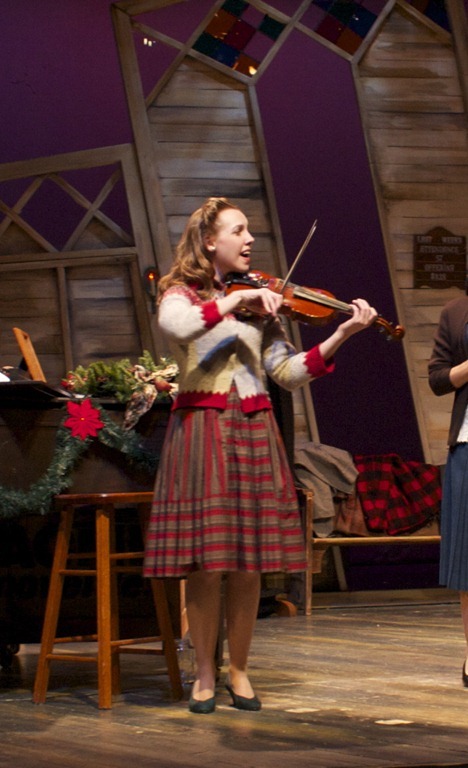 With Sanders Family Christmas, Provision has produced an inspiring musical that is as smart as it is heartwarming. The original Godspell (an archaic spelling of the word “gospel”) was produced in 1971, just as flower power was wilting, eventually replaced by disco fever later in the decade. At the time, many were still holding on to their all-you-need-is-love mentality despite the demise of the hippie community along with the increasingly unpopular Vietnam War. As a result, many found comfort in close-nit cults and communes, while others just moved on with their lives. Still, for some, there was a Christian reawakening, a dawning of the Age of Aquarius in which it was foretold that man would achieve a greater understanding of Jesus’ message of peace and harmony. Had Godspell, a musical based on the Gospel According to Matthew, been produced at any other time, it would not have ever reached the levels of success it did. First a hit off-Broadway and then a hit on Broadway, the show saw more than 2,600 performances. Its song “Day by Day” was 13th on the Billboard pop singles chart in 1972. And in 1973, the musical was made into a major motion picture. But these days, it appears that the portrait of the peace-loving Christian has been painted over with the image of Bible-thumping Pharisees. This begs the question: In a world populated with apocalyptic celebrities ministers, can Godspell remain relevant? In the hands of Provision Theatre’s extraordinarily talented director Tim Gregory, it can and does. Provision’s interpretation frequently wanders off-book from the original. This is no surprise considering the show—which is really just a bunch of parables strung together—plays more like an improv review than it does a play. Characters call out to one another casually, egging each other on as they bring Jesus’ teachings of righteousness and justice to life. 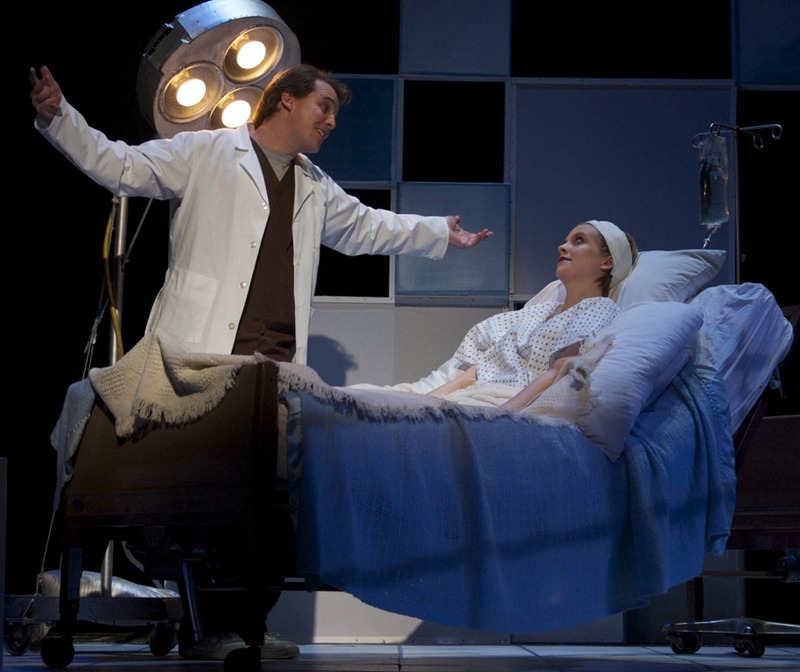 Gregory uses the play’s spontaneity to insert pop-culture references that serve to remove us from the musical’s dated soundtrack and transport us to the present. Be prepared for riffs on Facebook, Beyonce and the stimulus package. The jokes are utterly cornball, but then again, so is Godspell. The costumes (created by DJ Reed) have also received a reboot to keep up with the times. Characters have traded in their bell-bottoms and denim for loud, funky garments. The end result looks like an Old Navy commercial starring Jesus and John the Baptist. Gregory’s staging and Amber Mak’s choreography are really the highlight of this production. There’s a lot of group movement going on, but no matter how many bodies are in motion, everybody acts and reacts with one another physically, creating a larger whole out of the many parts. It is here, through the collective action, that the play’s message of connectivity and brotherhood is most apparent. Unfortunately, most of the ensemble’s voices are lacking, which is really a significant downside for a musical. Vocal precision is rare. Instead, notes warble, passing from flat to sharp. A cordless mic is used often to enhance lead vocalists who, I suppose, don’t have the pipes to belt it out to the back of the room. There are some standouts, however, particularly Justin Berkobien as John the Baptist and Amy Steele, who sings the lead on “Day by Day”. 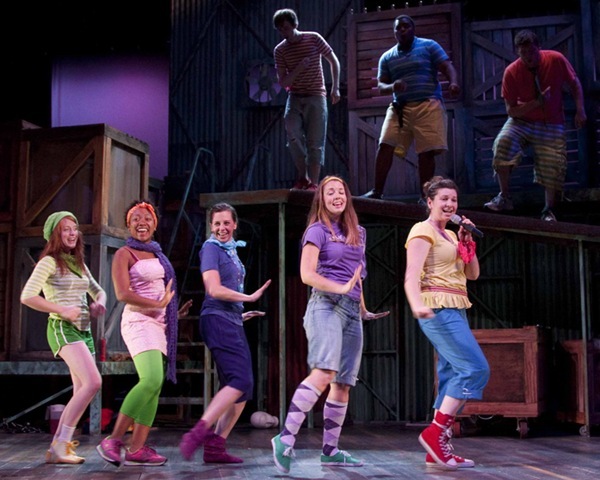 Provision’s Godspell is just as slaphappy and feel-good as the original. That’s fine for those who already have Jesus in their hearts. But for the cynics or the persecuted, it might ring a little out of touch with contemporary displays of Christianity. As for those that just want to see some song and dance, don’t expect a choir of angels – but there’s certainly clever choreography! ….Provision Theater’s production of Godspell was, in two words, very energetic. The joyfulness and exhuberance I mentioned above abounded from start to finish, and the actors’ collective excitement infected the audience. They properly exaggerated their characterizations, their timing was sharp, the cabaret was amusing, and the flow of the show was kinetic. But there were two major weaknesses, the first being that of bad acoustics and the second, that of bad singing. Despite the presence of some impressive vocal talent in the cast, a few soloists were clearly unprepared, one of whom caused me to cringe from his off-pitch screeching. Read the entire review. The Hiding Place is the story of a brick wall in the ten Boom (sounds close to Tannenbaum) residence in Nazi-occupied Holland during World War II. The ten Booms are an upstanding, morally righteous Dutch Christian family from Haarlem. There’s Casper ten Boom (Dennis Kelly), the greying patriarch, who, with his tailored suit and clocksmith’s shop, might as well be a stand-in for father time flanked by his two daughters, Betsie ten Boom (Cynthia Judge) and Corrie ten Boom (Lia Mortensen). Betsie has a prodigious commitment to her faith that makes her character appear to toe the line between naivete and sainthood while her sister Corrie makes up for her sister’s sincerity with cynicism, a kind of cynicism crystallized by loss and hindsight since it’s Corrie’s 1971 book that gives the show its title and its content. 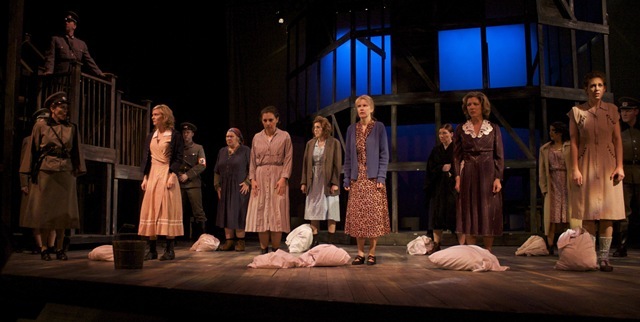 The play begins with Corrie ten Boom at a speaking engagement – discussing faith, forgiveness, and the loss of her sister, and what forces moved her to set up the rehabilitative organization to which she is both steward and spokesperson. All of a sudden and out of the crowd walks a frenetic, apologetic stranger who reveals himself to Corrie and offers money. He explains who he is and where the money is from and at the mere mention of his name, the elderly Corrie’s knees buckle and she collapses in a faint onto a chair, asking after a glass of water. In what follows, we leave the elderly Corrie ten Boom scene behind and travel back to where things began, starting in the early days of Nazi-occupied Holland when the Dutch underground is hiding deeper and deeper and becoming ever more necessary and desperate. As the story unfolds, we are told all we need to of the ten Boom family. We watch them celebrate holidays, mourn the loss of a son to prison – all due to a flagrant and patriotic (in all the wrong ways) act of pride that forced a Nazi to smash his piano-playing fingers before hauling him off to prison. We watch the underground melt from a world of friends to a world of ever-more-anonymous and furtive collection of men all and only known as "Mr. Smith." We watch the righteous ten Boom family take in, house, and feed one Dutch Jew after another, each offering the story of flight into hiding as another stroke in the composite portrait of a community facing Nazi destruction. We watch the ten Boom collaborate with an industrious group of construction-minded "Mr. Smiths" to build an impervious, brick-enclosed hiding place. And then we watch as the Gestapo arrives and the ten Booms are betrayed and Betsie and Corrie are carted off to a prison, and a concentration camp and finally after nearly three hours watching faith, hope, and an enduring belief in the goodness of humans clash with unspeakable cruelty, Corrie – and by extension the whole audience (since by this time Corrie is the only continuous presence – the narrator whose trail we follow) – is confronted with an question about the limits of forgiveness. The Hiding Place is an undeniably powerful story. And in the hands of Provision Theater‘s Artistic Director Tim Gregory, the adaptation boldly and faithfully animates the story. But in a few places (the muddy mix of accents, for example) a gesture intended to reinforce the authenticity of the story and stay as close as possible to the narrative itself gets in the way of telling it and telling it well on stage. Translation from the page onto the stage doesn’t necessarily need to bear in the character’s speech the artifact of their origin. The accents wind up lending the show an inconsistent feel (as any unfamiliar accent might over the course of three hours and so many characters) that detracts from the shows other successes. Isaac B. Turner‘s costumes and Inseung Park‘s set, for example, offer color and character without any of the trappings of an obscure, unfamiliar accent that isn’t always well-delivered. Park’s set is a post-and-beam skeleton of a house that calls to mind Todd Rosenthal‘s Tony-winning design for August: Osage County. And then, during intermission, the drama-in-a-big-transparent-house element, so familiar to American theater-goers, evaporates into the shapes of an abstracted, oppressive prison-or-concentration-camp. 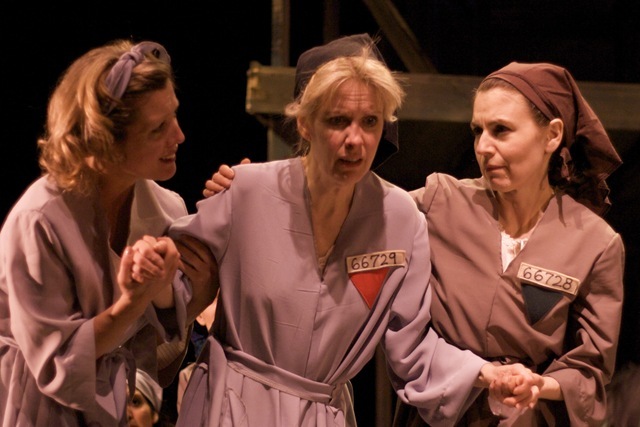 The choice to spend so much time in the grey, faith-testing agony of a concentration camp is a lot to bear and this production, though well wrought, informative, and necessary, is rewarding for its audience without always being kind.